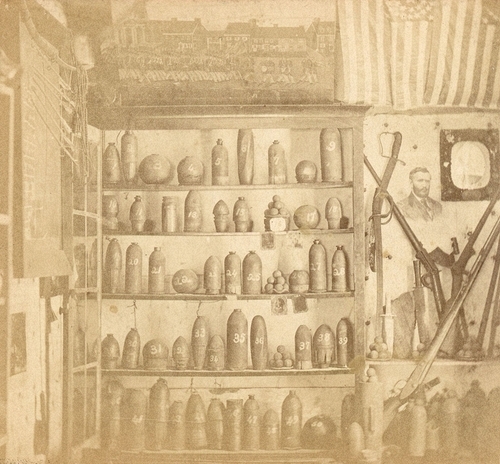 A close-up of six shelves full of artillery shells and related. Possibly a combination of Union and Confederate. Most are numbered, so there is likely a key to identification at the display but not visible in the photograph. At the right are about 6 rifles and firearms. Above them is a photograph of General U.S. Grant. To the right of him is a framed photo. Above are several U.S. flags, one with a circular star pattern. At the left top is a large oil painting that may be Union soldiers marching in Gettysburg.